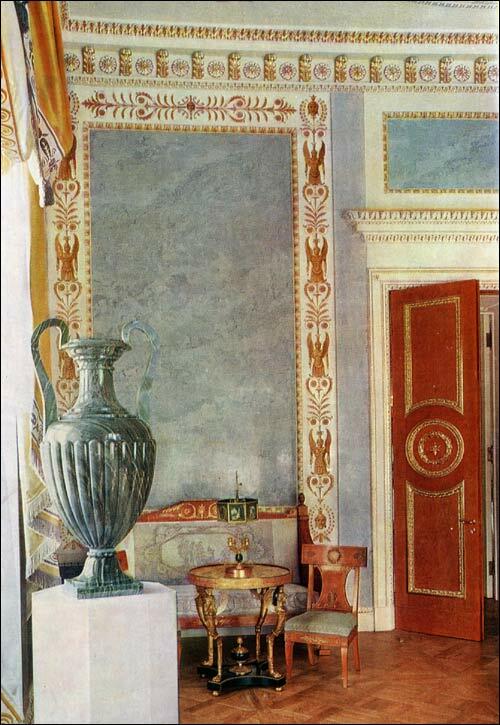 The Corner Drawing Room, - the former bedroom of Paul I, redecorated in 1816, - was created by Rossi. In the middle of the nineteenth century, the room was remodelled. The restoration of the 1960s, which returned to the room its original aspect, was based on such of the surviving details of Rossi's decoration as were retained in the later version; on Rossi's own coloured drawings; and on some archival documents of his time (accounts and official records of the progress of work). Since the Drawing Room was intended for official receptions, Rossi gave it an air of formal stateliness characteristic of palace interiors in the early nineteenth century. 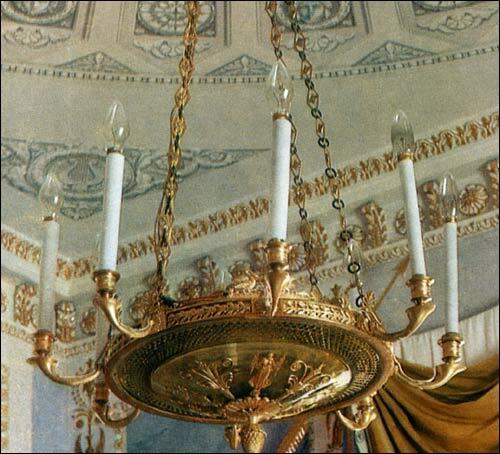 Here he used coloured stucco, white and gilt mouldings of a severe pattern, ceiling painting in grisaille, etc. The vivid violet and lilac tones of the stucco panels on the walls form a contrast with the borders painted with ornaments the colour of gilded bronze. The door is of Russian birch with gilded carvings, as is the furniture set made from Rossi's sketches by a St Petersburg cabinet-maker named Johann Boumann. In harmony with the furniture are the draperies of golden-yellow silk with a lilac edging, and of white silk trimmed with yellow. 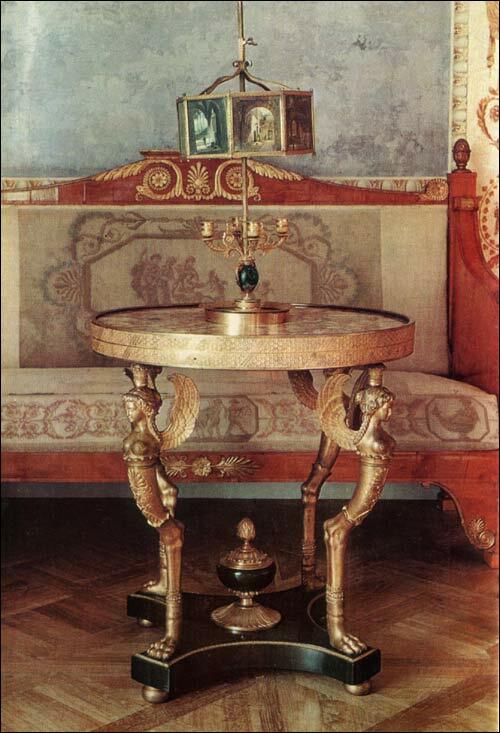 The bronze clock and candelabra, the chandelier of exquisitely chased bronze and coloured crystal, the vases of porcelain and hard stone modelled from Rossi's sketches, all add to the unity of impression: like Voronikhin, Rossi designed all the furnishings in his interiors. The Corner Drawing Room is a perfect example of the late classical style, expressed most vividly in the works of Rossi.